The Regulation of Information Act may be strengthened to deal with rogue crisis pregnancy agencies. 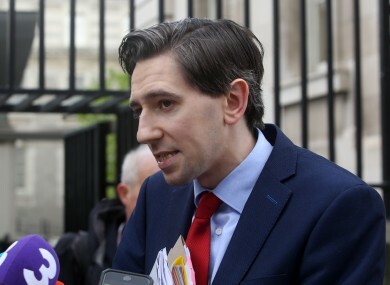 HEALTH MINISTER SIMON Harris has said he is looking at strengthening the Regulation of Information Act 1995 to prevent “rogue” counselling agencies misleading women in crisis pregnancies. The Regulation of Information (Services Outside the State for Termination of Pregnancies) Bill 1995 was a product of a referendum in November 1992. The Irish electorate voted for the fourteenth amendment of the Constitution granting citizens access to information about abortion services available abroad. ‘Rogue’ crisis pregnancy agencies which give misinformation about abortion to women have been operating in Ireland for more than a decade without any regulation. The agencies – which advertise as offering advice on all options available to pregnant women but which focus on anti-abortion information – have been in the spotlight in recent months following a number of investigations into clinics published by The Times (Ireland edition). During a discussion of the Health and Social Care Professionals (Amendment) Bill 2017 at the Joint Oireachtas Committee on Health today, Minister Harris said he was “sickened and appalled” at the “misleading nonsense” peddled by the agencies. He said everyone in the Dáil wanted to see the issue addressed urgently. “We are proceeding with haste and I will lay the provisions before the House in the Autumn,” said the minister. The Health and Social Care Professionals (Amendment) Bill 2017 seeks to address gaps in the provisions relating to the appointment of professional members to the Health and Social Care Professionals Council and to provide for the registration of physiotherapists/ physical therapists in the register of physiotherapists. It was envisaged that rogue crisis pregnancy agencies would be dealt with under the Bill. Sinn Féin’s Louise O’Reilly submitted an amendment to the Bill, seeking for counsellors who work for organisations that give information, advice and counselling, including those that counsel pregnant women in crisis pregnancies, to be regulated. O’Reilly said she would be happy to withdraw her amendment if the minister could offer “some comfort that we need not be worried” that regulation is on the way. Harris said he would not be able to accept O’Reilly’s amendment, stating that dealing with this issue will have to be done through regulation, and not in this Bill. He said his department is reviewing if amendments can be made to the Regulation of Information Act “to further strengthen” the law. The minister reassured the Sinn Féin deputy that his department was “genuinely taking action” on the issue, and he would bring forward regulations after the summer recess. O’Reilly told the minister that as committee members sat in the room, women were attending these agencies and receiving information from people who “seek only to traumatise them”. She said she accepted the minister’s assurances that action would be taken. Email “Harris 'sickened' at the 'misleading nonsense' spread by rogue crisis pregnancy agencies ”. Feedback on “Harris 'sickened' at the 'misleading nonsense' spread by rogue crisis pregnancy agencies ”.